Simon Pegg would kill for a beer. Will. Has. Is. Over and over again. An hour into The World's End, halfway through a pub crawl he's been waiting twenty years to finish, he engages in a beautifully choreographed kung fu spectacle with an army of blue-blooded robots (literally and figuratively—when killed, they explode with a viscous, cyan goop the consistency of acrylic paint; they are also a kind of walking metaphor of middle class British respectability). He holds a beer in one hand, a full English pint, while he twists and weaves, kicks and punches, smashes heads, tears off arms, plunges his free hand into body cavities. All the while, his beer—his delicious, golden beer, with a delicate white head lacing up the sides—survives. He spills a few drops—more than a few drops, sloshing it back and forth as he does his best impression of Bruce Lee with a bad case of the DTs. You get the impression, watching the scene, that he wants to survive, but that his survival is only a means to an end. The real object is finishing his beer, finishing the crawl, watching another glass bubble up with that frothy amber nectar. It's a metaphor, I suppose, but true to director Edgar Wright's style, it's a metaphor so exuberantly unsubtle that it stretches the definition of the word. He cares more about this beer than his life. The film works, not because it hangs its relatively ponderous conceptual weight on this non-metaphor, but because the core of the story (the movie's "heart," if you must) is a story of friendship. Specifically, strained friendship, "I hope I don't run into that guy" friendship, "Wish I could stop and talk but I'm in a hurry, let's catch up later" friendship, "I think I'm going to finally delete him on Facebook" friendship. Terminal friendship. Metastisizing friendship. Friendship that must be removed if the body is to survive. It's a variety of friendship that, understandably, is less treated in big budget action films than its more palatable cousin, that brand of friendship that shows up more often in fiction than it ever does in the wild: best friendship. Lifelong friendship. "Call each other on the phone once a week to ask how the grandkids are doing," friendship. The World's End is a movie about the impermanence of friendship, the truth that, much as we would like to hold onto our friends forever, we can’t. We change, we grow older, we begin to resent each other or—worse—grow indifferent. Pegg's character, Gary King, has escaped from a treatment center, refusing to reckon with a lifetime of mistakes and shortcomings that have culminated in an attempted suicide. In a nostalgia choked opening montage scored to ‘90s Brit pop, King talks about the best night of his life, a pub crawl that he and his "mates" attempted on one of their last nights together before splitting up and moving on from the small British village where they grew up. Twenty years later, he rounds up the old friends to make one last attempt at a pub crawl. He visits them at their jobs, in their homes, living their imperfect but hard-earned lives, and convinces them to go back. Gary, meanwhile, is the same man he’s always been, down to the t-shirt and beat up car. What he doesn’t realize is that their world is already over—not because their town is a homogenous series of manicured hedges and chain restaurants, and not even because their neighbors have been literally assimilated into a cybernetic army, but because the common experiences they once shared have faded away. They are no longer the people they once were. You can’t really talk about The World’s End without talking about its predecessor, Edgar Wright’s first studio film, the 2004 zombie masterpiece Shaun of the Dead. Shaun is more direct than the latter film, less emotionally ambiguous, more hopeful, and more amenable to elevator pitching: Simon Pegg plays Shaun, a lovable loser whose girlfriend Liz dumps him because he can’t seem to grow up. The night of the breakup, Shaun and his friend Ed obliterate themselves with drink at their favorite pub. In the morning, they wake up to find that the world (or at least suburban England) has been overrun by zombies. In rescuing Liz, Shaun proves his ability to take responsibility and wins her back, but at a heavy cost: his step father, mother, and friends succumb to the zombie hordes. In comparing the two movies, I keep coming back to Shaun of the Dead’s ending, equal parts upsetting and sweet. Ed has been infected, skin gangrened and blank eyes rolling in their sockets, drool pouring from his moaning mouth. Ed’s life is over, but Shaun keeps him manacled to the floor in a locked shed so he can pop out for a game of Playstation when he gets a free moment. Queen plays happily on the soundtrack as the credits roll. So which is it? Mawkish testament to the power of friendship, or a satirical sting, a grotesque undercut to the idea that friendships last forever? Are Ed and Shaun still out there in that shed, long into middle age, playing Grand Theft Auto V while Liz watches the kids? I saw Shaun of the Dead the year of its release. My own best friendship had hit a difficult patch—an ill-advised attempt to share an apartment had led to enough petty disagreements and emotionally charged arguments that the whole arrangement crumbled, and soon the friendship with it. What felt like a trial separation turned out to be the beginning of a slow, gradual, mutual estrangement. I saw a lot of myself in the movie. I’d lived a few houses down from my own “Ed” all through high school. 2004, my second year of college, was the first time in five years I’d lived more than a few feet from him. Like Shaun’s Ed, mine was the impulsive, irresponsible type. He was always game to push you into some bad decision equally likely to become one of the best nights of your life, or one of your biggest embarrassments. To this day, although I haven’t spoken to him in years, some of the best times I’ve had were with him—playing poker and watching Star Wars until dawn, drinking already terrible rum turned tinny by cheap flasks, dancing very poorly at the one disgusting night club that both played ‘80s music and would let us in without ID. I could picture him gearing up for it. This idea that he would have a big intervention with me. The climactic moment when the hero wins his sidekick back after he’s gone astray. He was sure this was going to be the moment he made me realize what I’d become. But that’s the problem: this wasn’t a movie. Happiness isn’t measured in entertainment value. Being back in the fray, side by side, drinking pint after pint of beer together, fighting off robots or zombies, or whatever thin metaphor we could come up with to stand in for growing up, moving on with our lives. It wasn’t a life. I was angry, because it was such a selfish thing to say, and so typical for what our relationship—or lack thereof—had been like in its death throes. Him trying to make me feel guilty for my clumsy attempts at “settling down.” More than anything, I was sad. I was sad that he thought our friendship was still strong enough that I would give up so much just to spend more time hanging out with him. A small part of me, maybe, wished that it was. I didn’t say any of this. I told him to drop it. And it’s one of the last things I ever said to him. The World’s End tries to have a happy ending. You can feel Edgar Wright and Simon Pegg (who wrote the movie together) straining to convince the audience, and maybe themselves, that the new status quo is better than what came before, that the world has been reborn, that the characters are living up to their destinies. I don’t buy it. The leader of the robots, “the Network,” offers Gary King, dubiously elected to represent the human race, the chance to join a galactic community of planets united by technology. The cost? A few humans have to be turned to mulch. King refuses, and the aliens retreat, leaving in their wake an explosive burst that wipes out all technology on Earth. In the end, King has turned down the chance for the human race to live out its Star Trek fantasies in the name of human imperfection. Is it the right choice? Maybe. Is it our mistakes that make us more human, or is this a bedtime story we tell ourselves so that we can continue making them? In the end, Gary King goes sober. But he doesn’t kick that subtler, more insidious drug: nostalgia. In the post-Apocalypse, he travels the land with the robot clones of his old friends, reliving the glory days of his youth even though the world around him is nothing but rubble. Whether it’s a bad decision or not, at least he got to make it. I saw The World’s End last summer, mere days before Meagan and I moved across the country to start a new life 3,000 miles away from everyone we’d ever loved. When I saw the movie, I was brutally hung over (not the most pleasant state in which to watch a movie whose premise involves 5 friends drinking 12 pints of beer each, but I digress). The night before, we sat at our favorite pub, saying goodbye to the friends we’d made and managed to keep after almost three decades in Atlanta. My “Ed” wasn’t there, but he didn’t need to be. Just like in The World’s End, not everyone made it to the ending. But those who did were the only ones I wanted there, the ones who had finished that particular journey with me, our bonds stronger because of all the things we’d done together, and to each other, over the years. 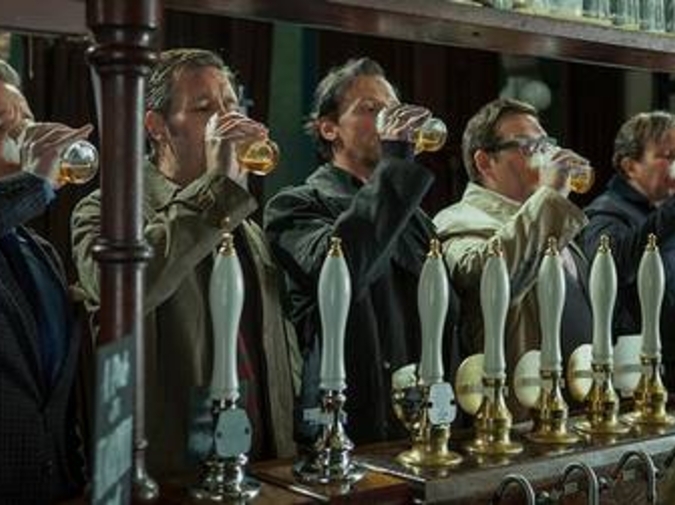 Unlike Shaun of the Dead, the two friends don’t end up together in The World’s End. This time around, Nick Frost plays Andy, who delivers an exposition-heavy voice over explaining that he hasn’t seen Gary since after the world ended. He misses him. It may not be a happy ending, but it’s the one I need, and it’s the one I prefer. The ache that it gives me in the back of my throat makes it feel truer. It speaks to the uncertainty we are left with when we make difficult choices, the nagging questions that are left behind. I would say I’ve been lucky in my friends if I didn’t understand how hard you sometimes have to fight to hold onto them. Gary King knew this from the beginning. It isn't the beer he's fighting for, really. The beer—of course—is only a symbol. It's a stand in for a feeling that he can never get back. The feeling that he and his friends are in this together. The feeling that the night will never end. The feeling that they are indestructible. The assurance that they will never get old, lose touch, have families, lose families, and die. Naive as it is, impossible as it is, can you really blame him? Isn't that something worth fighting for, dying for, tearing the head off of a robot and bathing in its cobalt blood for?